The Voice that Cries in the Wilderness is the Key to your transition out of the wilderness. Not even Jesus took a shortcut. *[[Mat 3:13-15]] KJV* Then cometh Jesus from Galilee to Jordan unto John, to be baptized of him. But John forbad him, saying, I have need to be baptized of thee, and comest thou to me? And Jesus answering said unto him, Suffer it to be so now: for thus it becometh us to fulfil all righteousness. Then he suffered him. Church folk love to hear what the world is doing wrong, but we hate to hear what we’re doing wrong, and how what we do wrong is even more destructive, bringing shame to Gods name. The Spirit of Elijah is not a sacrifice you make if you want to get money and fame in the church or in the world. Confronting idolatry is something you do to prepare the way of the Lord, and sacrifice for the next generation of children. It’s a REAL sacrifice, for heaven, not earth. Elijah himself was hated by a whole nation. John the Baptist was killed for operating in it. But he prepared the way for Jesus to come the first time. In this second coming of Christ, the Spirit of Elijah will come first again. Do you want Jesus? Do you care for the next generation? My first son has the chance to influence his little bros and sisses in right or in wrong – by example. He can make our parenting job easier or harder. And he can get rewarded by God for leading his generation in righteousness or be punished for leading his generation in disobedience. It is similar in spiritual leadership – when you make disobedience appear successful, you become spiritually responsible and accountable for those who imitate or follow your disobedient influence. God is a great accountant and He knows how to trace rewards and punishments for good seeds of influence and bad seeds of influence. – This is why James 3 says that masters, (or leaders) have a greater condemnation. God was saying that not too many people should put themselves into position of leadership or teaching without God telling them, because they might cause people to be offended with their words. Today we use this word “offense” as if it means emotional insecurity or perceived disrespect. This word as used in the bible actually means to stumble, and in a disobedient step off the path off God. This is a major problem in the Body. People see the Word “offense” and think it has something to do with emotional insecurity or perceived disrespect rather than “stumbling off the path of obedience” to God. Hosea 14:9b …for the ways of the LORD are right, and the just shall walk in them: but the transgressors shall fall therein. Matthew 18:6 But whoso shall offend one of these little ones which believe in me, it were better for him that a millstone were hanged about his neck, and that he were drowned in the depth of the sea. 7 Woe unto the world because of offences! for it must needs be that offences come ; but woe to that man by whom the offence cometh! He was saying that if you cause a small believing child to disobey and stray from obedience to God, your punishment is so great, it would be better for you to drown in the ocean. He was saying that a lot of punishment is coming on the world because they cause people to stray from obedience to God. Whoever allows themselves to be the messenger or example of disobedience is going to be punished horribly. Matthew 11: 4 Jesus answered and said unto them, Go and shew John again those things which ye do hear and see : 5 The blind receive their sight , and the lame walk , the lepers are cleansed , and the deaf hear , the dead are raised up , and the poor have the gospel preached to them . 6 And blessed is he, whosoever shall not be offended in me. He wasn’t rebuking John the Baptist for being emotional or asking a bad question, he was encouraging John to stay on his path of suffering in obedience, because JB had an important role in making a way for the Messiah, AND a share in the reward for the miracles Jesus was doing. He then went on to say JB was the greatest man ever born of a woman – he wasn’t rebuking him for perceiving disrespect or being emotional. He was in essence, letting him know his cut of the rewards for his obedience. When you see the word “offense” as loss of emotional harmony, the devil will attack you and put roadblocks of conflict on your path of obedience to Gods will. Then you will leave the path of Gods will because of the conflict, keep the emotional harmony, smile and say “I’m not offended.” However, you really are offended, because you stumbled off the path of obedience to God. As a leader, your main goal is not to cause people to stumble off the path of obedience. It’s not just words that can cause people to stumble from the path of obedience, it’s also your example. Words are just the beginning. People do what they see, especially if they see people in positions of power and success doing them. – This is why Proverbs says if a leader listens to lies, all his servants are wicked. As a leader by example, if you even listen to a lie, all your servants become wicked and twisted from righteousness. 2 Chronicles 7:14 If my people, which are called by my name, shall humble themselves, and pray , and seek my face, and turn from their wicked ways; then will I hear from heaven, and will forgive their sin, and will heal their land. It’s not necessary to get sinners to stop doing this or that. It’s necessary to get so-called believers to obey, pray and walk in self-sacrificing holiness instead of compromise. That’s when God is released to heal the land. God didn’t give unbelievers the authority, He gave believers the authority. When you try to outsmart God in this way, you get punished even more harshly for spreading corruption, even if you still look good in the eyes of the masses. The influence and money you gain “for God” by disobeying Him is actually a negative for you and for everyone under your influence. I used to think people that were supposed to know the Word didn’t know the Word. Now I realize that many Christians know the written Word of God AND know the voice of God, but just refuse to obey Him in order to have success in the eyes of people. I have seen, heard and experienced many people who know exactly what God wants Biblically, AND have clear direct instructions from God, but choose to do the opposite, in order to have temporary success. It’s actually human nature NOT to make smart decisions, but to go with what makes you and others comfortable emotionally. I’ve been guilty of this myself. Just a few days ago, I had a decision where I could cut down the data on my cellphone plan and save cash every month. Even though I didn’t need unlimited data, and hardly used it, it was difficult for me to make the smart decision. Why? The stupidity of my emotional comfort was the reason. Ask any business person, most people make decisions 80% on today’s emotion, even against hard facts and clear evidence of long term benefits. A product that is better, and saves customers money every month is actually hard to sell, because it makes people change when they don’t want to change. The same thing works with spiritual decisions. But Abraham sacrificed Isaac, and passed Gods test to give up temporary success for permanent success (Hebrews 11:17-19). That’s real faith. A man that is working for his wedding day works hard and suffers long with no problem, because his wedding day stays on his mind (Genesis 29:20). If he thinks only about avoiding his suffering today, he quits. Then he gets sad, scarred, and looks for a prostitute instead of a wife. Spiritually it’s the same: in order to really obey God, you have to have more faith in the Eternal Joy Set Before You (by meditating Gods ETERNAL promises and rewards) than you have in the temporary reward from pleasing people and making a temporary profit. People follow what appears to be successful. But in leadership, the more skilled you are at disobeying God and making it look successful, the more Blood is on your hands. It may help you to avoid temporary suffering and loss – but you end up spreading disobedience, apostasy (falling away from the faith), and Tare Seeds across the body of Christ. Without public repentance the damage continues. At least with public repentance you can slow down the spread of Corrupting the Word of God. True repentance and obedience to the Will (Logos) and voice (Rhema) of God even in difficult losses creates eternal joy and infinite rewards, both naturally and spiritually. *[[Joh 3:20-21]] KJV* For every one that doeth evil hateth the light, neither cometh to the light, lest his deeds should be reproved. But he that doeth truth cometh to the light, that his deeds may be made manifest, that they are wrought in God. Jesus called us the light of the world, because we reflect Him. He also said to “marvel not” (don’t be amazed) if the world hates you. So if we are the light of the world, why does the world hate us? The answer is found in John 3:20-21. Jesus Christ summarizes the psychological state of everyone in the whole world. Because their deeds are reproved – why? they want to avoid their actions being spoken against. They want their deeds to be exposed as obedience to God. So if sinners hide from the light, and we are the light, what is the link between people that do evil and people that do truth? One word- Repentance. Repentance is when people who evil come to the light to get their deeds reproved and change their works to works done in God. Repentance – the greatest miracle on earth. The only miracle that heaven rejoices over. Jesus called John the Baptist a “burning and a shining light” and the “greatest man born of a women.” Greater than Elijah and Elisha, and all he did was get people to repent – without any other miracles. Then he said that the least in the kingdom is greater than JtB. That means that those in the kingdom of heaven would get a lot of people to repent… Plus more. Jesus showed us this by example. Many repentant sinners followed Him, plus He did other miracles and healings. Notice that the link between believers and unbelievers is not compromising or turning the light down. Its not subjugating your light to the darkness. Its the other way around! Yes its the goodness of God that leads people to repentance. And its the obedient preacher that gives them something to repent from! Repentance is not achieved by our intelligence, but by a miracle of God in response to the foolishness of preaching. If you love Jesus and want him back soon, think about this: Malachi 4. The Spirit of Elijah comes first. Malachi 4 4Remember ye the law of Moses my servant, which I commanded unto him in Horeb for all Israel, with the statutes and judgments. 5Behold, I will send you Elijah the prophet before the coming of the great and dreadful day of the LORD: 6And he shall turn the heart of the fathers to the children, and the heart of the children to their fathers, lest I come and smite the earth with a curse. The Spirit of Elijah did not turn hearts of people by preaching a message on ‘turning your hearts’. He didn’t say “Fathers, turn you hearts back to your children. Children, turn your hearts back to your fathers,” even though those would have been very good messages. The Spirit of Elijah set up a confrontation with idols and false prophets. He let them have the stage for as much time as they wanted. He let them set up their altars. He let them have the advantage, 450 to 1. He clowned them. He gave himself a disadvantage, making his altar especially hard to “catch fire” by dousing it with water. What did all the wishy washy, 2 opinion cowards say when it was time for the confrontation – “not a word.” They really didn’t know whether to worship God or Baal (the idol of money & power) (1 Kings 18:21). But when the fire came, the people automatically said “the Lord is God.” Then he killed all the false prophets. This is the same spirit of Elijah that manifested in John the Baptist before the first coming of Jesus the Messiah. He confronted the religious leaders of his day that really worshipped Baal (the god of money & power). They were good at getting money, but not good at loving God with real fruit. He gave himself a disadvantage – preaching in the desert instead of on a mountain or in the middle of the city, or the temple. His father was a High Priest, he could have had an easy platform if he wanted. People came out to hear and repent and be baptized, and he rebuked the false religious and political leaders of his day. A Confrontational Preaching Anointing is what God will manifest before Christ’s 2nd Coming also. If you really love Jesus Christ and want to see Him soon, don’t be scared to confront the false idols and false prophets of today. That’s what is necessary to see revival, a great awakening, the last days harvest, and the 2nd coming of Jesus Christ. Do you really love Jesus or not? If I had known this before, I would have entitled my book: “Bringing Jesus Back Quicker.” Why, because Holiness Hastens the coming of the Lord (2 Peter 3:12). 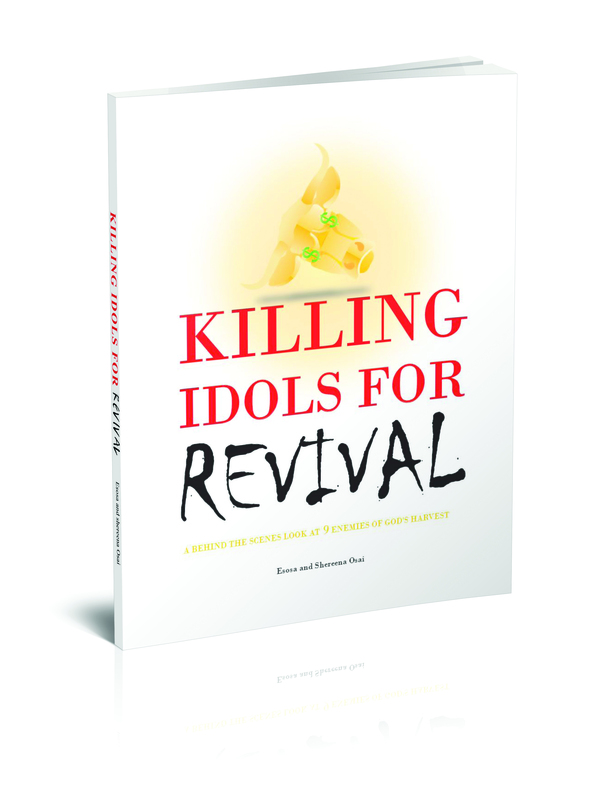 But alas, too late, it’s called Killing Idols For REVIVAL. Order it today.